Kedgeree is one of my favourite rice dishes. I believe it has it's origins in the British Raj in India. I know it came to fashion in Britain during the 19th Century, probably as a result of returning ex-patriates wanting to duplicate the best of British India here at home. My version uses smoked haddock, but any good smoked fish works well, even smoked oily fish like mackarel. Place the smoked haddock fillet in a large saucepan with the bayleaf, milk and water. Bring to the boil and simmer for 7-10 minutes. Please please don't overcook the haddock; as soon as it is capable of being flaked, take it off the heat and set aside. Allow it to cool slightly and then use a pair of forks to separate the flakes of meat from the bones and skin. Set the lean flakes aside and retain the cooking liquor. Hard boil the eggs, peel them and chop them into quarters. Set aside. For the rice, heat the oil in a large heavy-bottomed saucepan that has a tight-fitting lid. Add the shallots or onion and stir-fry until soft and translucent. Add the ginger and garlic and stir-fry for a minute. Add the dry rice and fry until all the rice is coated in the oil. Add the water (and/or the cooking liquor from the haddock) and stir once. Add the saffron and the peas. Place a tight-fitting lid on the pan and bring to a rapid boil. DO NOT REMOVE THE LID; the rice will cook in the steam, so removing the lid will ruin this dish. Once a rapid boil has been achieved, turn the heat down to the lowest setting possible for 3 minutes, then remove the pan from the heat. DO NOT REMOVE THE LID for 10 minutes, at which time you will have perfect rice. 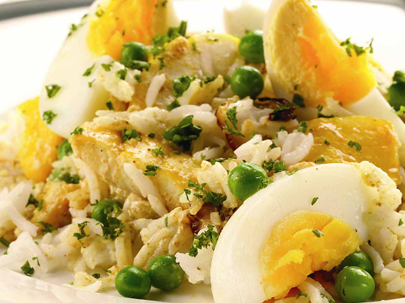 To assemble the kedgeree, fork the steamed rice until it is loose and fluffy. Add the haddock flakes and eggs and stir to mix. Garnish with the parsley, spring onions, cashews and crispy onions. Serve immediately.